Results of a scanned skin concern. 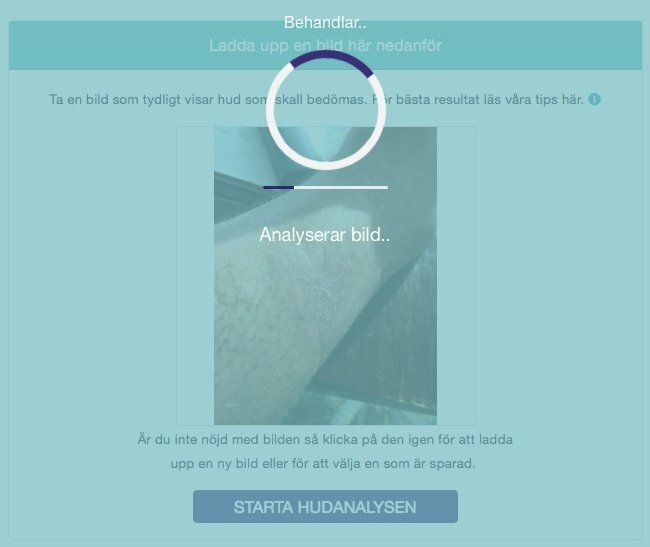 Top 3 probable results are shown, and always includes a 4th answer on the probability of malignant melanoma (in Swedish). 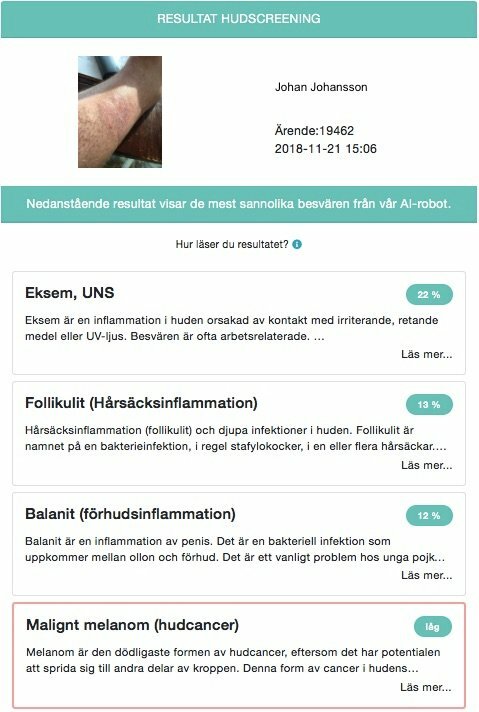 STOCKHOLM, SWEDEN, November 27, 2018: Medicoo, one of Sweden’s first digital healthcare centers, have launched a fully automated solution, with the help of image recognition and artificial intelligence (AI) can quickly screen various skin disorders, including skin cancer, malignant melanoma. Malignant melanoma is one of the cancers that has been on the rise in Sweden in recent years, and is a cancer that can be cured if caught early enough and removed with surgery have a 80-85 percent survival rate . In an eye-catching feature of the TV4 News channel dated 6th November, the Swedish patient melanoma association demanded that skin cancer care to be managed nationally, and encouraged the use of modern technology such as smartphone cameras . Medicoo has now launches a solution. By uploading photos of suspected moles or other skin disorders, a quick screening is carried out by AI. The AI ​has been trained on the most common skin problems with over 100,000 smartphone images. An assessment of malignant melanoma is always included in the answers. With an ordinary mobile phone camera and artificial intelligence, skin screening can be scaled. Skin screening via Medicoo, is in collaboration with First Derm and it will initially be offered free of charge. “Cases of malignant melanoma could be detected in time when the access to care is simple,” says Camilla Arneving, Marketing Manager.  Skin screening is an integral part of Medicoo’s medical service and worrying patients can easily book a medical visit online with a board certified physician. Before the doctor’s visit, a number of follow-up questions are answered about the skin problems and more images are uploaded. Referrals to a dermatologist can also be done quickly. Medicoo offers cost effective medical visits online for about fifty common problems in children and adults. By using new technologies, such as AI and chat bots, care can be done faster and better – without travel time and waiting rooms. Patients across the country receive help with counseling, prescriptions, medical certificates, referrals, sampling, diagnosis and treatment. Medicoo lowers the threshold for people seeking care, especially for inconveniences that may be perceived as embarrassing.